oftwominds-Charles Hugh Smith: If "Everybody Knows the Economy's Doing Better," What Is That Information Worth? Maybe the "smart money" knows the real numbers are now so far from the central planners' rigged statistics that the carefully constructed narrative of "recovery" is doomed to an unwelcome intrusion of reality. One investment truism holds that information known to everyone has no value.The reason is that there's no trading edge in information everyone knows. Trading edges result from information asymmetry, when a limited set of traders has information that is unavailable to other traders/ investors. Insider trading is one form of information asymmetry, and it is illegal because it gives those with knowledge known only to insiders an immense advantage in terms of exploiting market moves that will manifest once the news becomes public. Insiders who know a company will report an unexpectedly disappointing earnings report, for example, could buy put options that will gain in value should the company's stock tank once the news becomes public. Suspicions of insider trading rise when unusually large options positions are purchased before earnings reports are announced--and those options pay off handsomely. A recent article by Nick Colas of Convergex speculated that some of the most successful traders of the era may be holding an information asymmetry edge:What Has The Smartest Investors So Spooked? (Zero Hedge). Colas poses the question: what might they know that the rest of us don't? The problem with what "everybody knows" is the world's central plannersmanage perceptions by gaming the statistics that supposedly reflect the economy's health. The goal of central planners is to manage what "everybody knows" so the supposedly factual metrics will stimulate confidence in the economy's progress (and thus confidence in central banking / planning). This confidence in the "numbers" encourages investors and speculators to stay fully invested in stocks and bonds. This willingness to stay fully invested pushes stocks higher, a dynamic that generates the so-called wealth effect: as households and corporations see their net worth rise, they feel incentivized to invest and spend more than they would if their confidence in future returns was lower. Central planners rely on the mainstream media to propagate a rosy interpretation of the heavily spun "numbers." Thus the low unemployment number is presented as solid proof that the economy is improving (or "recovering," much as alcoholics are in "recovery"). The mainstream financial media dutifully presented completely bogus earnings reports as legitimate "beats," despite the fact that even a cursory glance at the reports reveal the "profits"are largely or totally the result of "one-time charges" and other accounting gimmicks. The success of central planners' rigged numbers and the credulous mainstream media's parroting of central planning spin is designed to manage "what everybody knows." Even skeptics of the rigged numbers must buy into the resulting stock rallies, lest they be left behind and end up being pink-slipped by investors or their employers. In effect, central planners have turned the truism about information asymmetryon its head: the only thing a money manager or investor needs to know is what "everybody else knows," i.e. whatever the central planners are distributing. The reason this has worked so well is the self-reinforcing nature of central planner's perception management: since "central banks have our back," bad economic news means central planners will redouble their stimulus efforts, guaranteeing higher stock valuations, and if the news is positive, well, stocks will respond by soaring higher: you see, central planning works! The economy is "recovering" nicely. No matter what the news, central planning works: it will reverse any dip in stocks due to bad news, and good news proves central planning is working splendidly. This suggests any information asymmetry would have to relate to forces that are beyond the control of the central planners' rigged-statistics / spin machines or a breakdown in the central planners' rigged-statistics / spin machines--in other words, a massive, sustained loss of confidence in the rigged stats and mainstream media spin. Consider what these three charts are saying about central planners's supposed success. 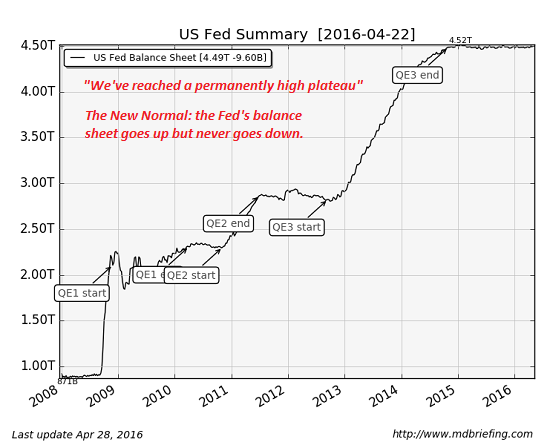 The Federal Reserve's balance sheet is pinned at a "permanently high plateau." Does this suggest confidence in future economic growth? 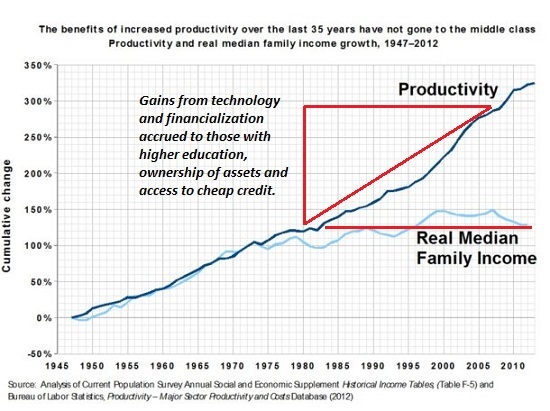 Productivity gains have flowed virtually exclusively to the top 5%. Recent studies have found that 81% of U.S. households have experienced declines in real income since 2000. Does this suggest confidence in future economic growth? 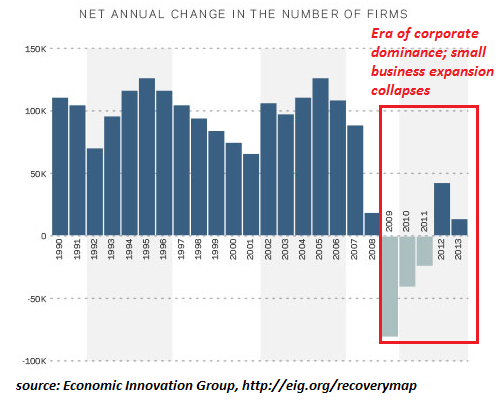 The growth of new businesses is a core trait of broad-based expansion. New business growth has stumbled since 2008. Does this suggest confidence in future economic growth? What could the most successful investors know that the rest of us don't? First, we have to factor in "talking their book," i.e. encouraging others to take actions that would profit their portfolio. If they are shorting the market, it behooves them to make their positions known so others might sell, pushing the market down. But this doesn't answer why they have built short positions in the first place. Perhaps they are betting on the collapse of confidence in rigged numbers and false media narratives about the strength of the "recovery." Perhaps they have access to the real numbers, and they are betting that the gap between reality and the central planners' rigged numbers is now so wide that a collapse of confidence in BS is baked in, regardless of how the mainstream media spins the resulting implosion. It wouldn't surprise me if stocks hit a few more new highs and then cratered.Maybe the "smart money" knows that the real numbers are now so far from the central planners' rigged statistics that the carefully constructed narrative of "recovery" is doomed to an unwelcome intrusion of reality. Thank you, Michael L. ($50), for your massively generous contribution to this site-- I am greatly honored by your support and readership.